Hey everyone, super excited that you are reading this post. 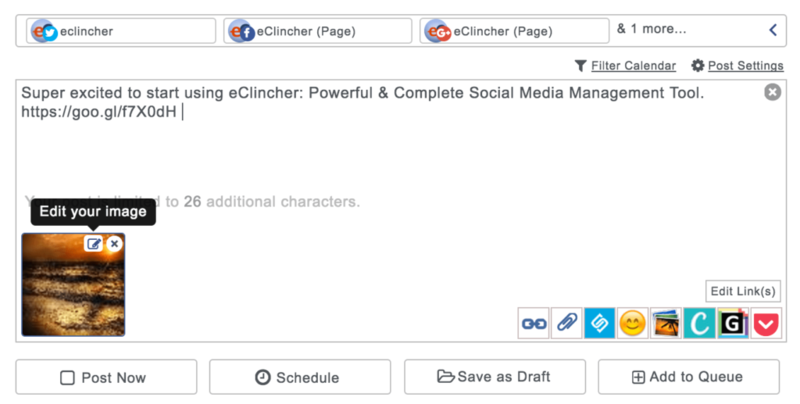 We have a TON of new features that will make you post publishing super easy. Our powerful features make every one of your posts stand out and help you to have all the tricks of the trade at your fingerprints. Let’s begin! Click on the account you would like to add – requires Login to each account. 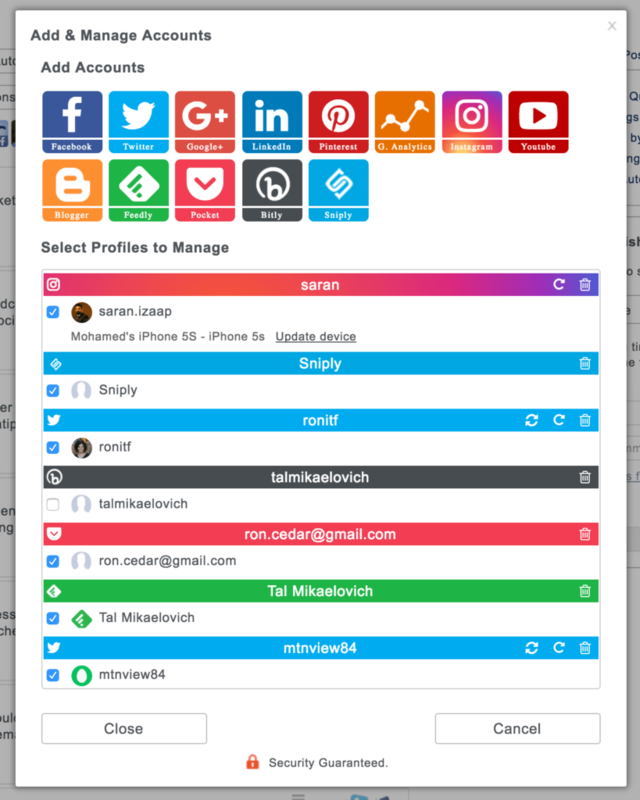 If you are adding more than one account of the same social network, make sure you log out first before adding addtional one (for example: if you are adding a 2nd Facebook account, make sure to log out from Facebook native app, before adding it to eClincher. 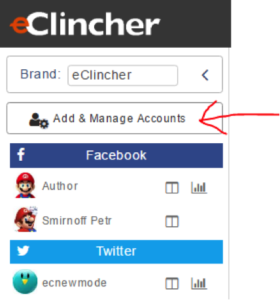 Check the boxes next to each account, profile or page you want to manage with eClincher. Cick SAVE when you are done. Now you are ready to start publishing your first post. Choose the social media profile, page or group that you would like to publish this particular post, write something you like, and you will notice the preview at the bottom. 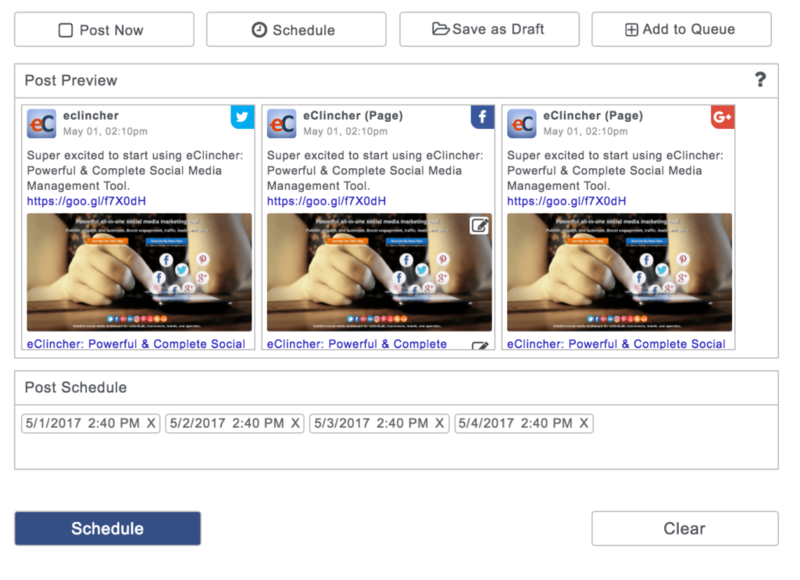 The post preview is a powerful feature (that no other social media management platform currently offers) where it shows you how your post will appear on each of social channel. Sometimes the post will be suitable for Facebook, but will not look good on twitter, so it’s always important to check how your post will look on each of the social media channel. Tip: if you publish to pages (Facebook page or LinkedIn company page), you can click on the pencil icon inside the preview. There, you can edit the title, description and even swap the image. If you would like to schedule the post for a future date then we have a variety of amazing tools for it. You can also attach or select from free stock images to make your post even more attractive. Click on the Attach icon or Images icon to find stock image. When you click on the Schedule button, a calendar will appear. You have a few options. If you want to schedule it for a specific day and time, pick the appropriate day and time on the calendar and click “Add to Schedule”. If you want your post to repeat at that selected time each day, week or a month, you can choose that option by checking Repeat posting. When you are done, click on Add to schedule. One more step, you have to click on the Schedule button (it can also appeared as Post & Schedule, if happen to check Post Now and schedule future times). Now your post will be published at your set date and time. You can now view all your posts in a calendar view (appears on the right side of the screen) or list view. All the blue dots represent scheduled posts or previously published posts. When you click on a specific date, you can see a preview of all the scheduled posts for that day. Tip: click on the calendar with the plus icon to view Visual Calendar. 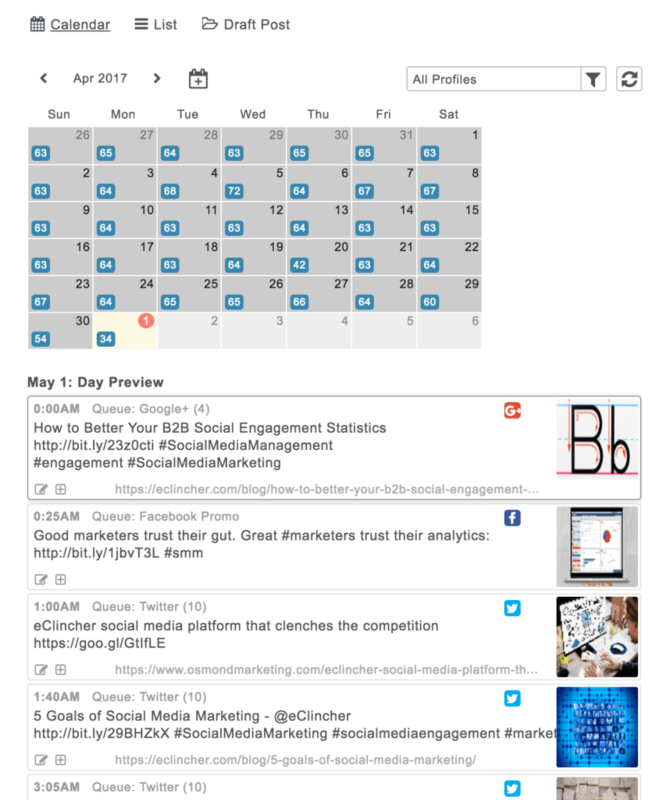 Visual Calendar allows you to view your scheduled posts and to preview each one (simply click to enlarge the post). 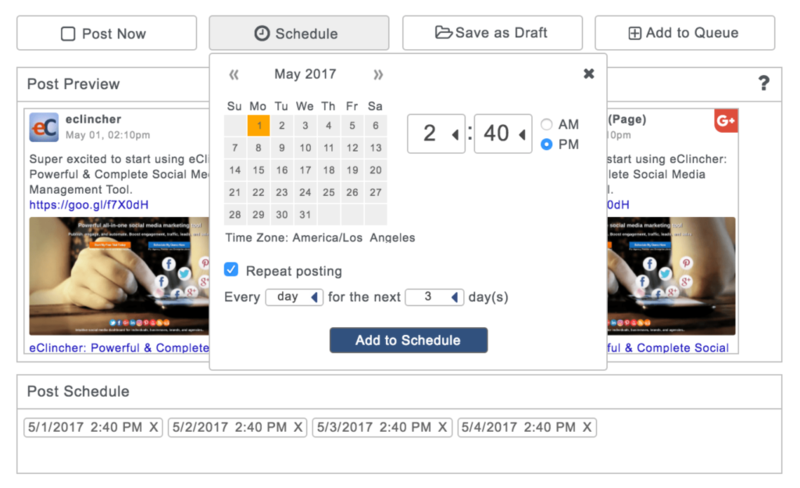 You can also drag and drop posts to re-schedule (coming soon). We hope that this tutorial helped you learn the ins and outs of writing, previewing, and scheduling your posts. Stay tuned for more powerful features that will make your social media posts even more viral and effective. 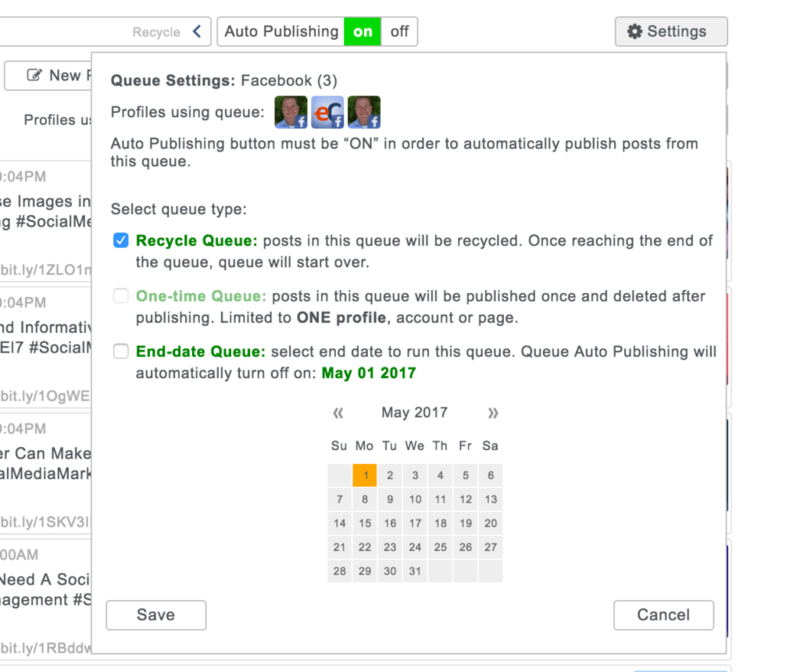 One of the most popular features that we have on eClincher is the Auto Post with Queues – automatically publish posts from queues to your social profiles, pages and groups. Make sure to pick the appropriate channel (Facebook, Twitter, Instagram, Google+, LinkedIn, Pinterest), because each social network has their own rules, post format, and allowable post length. 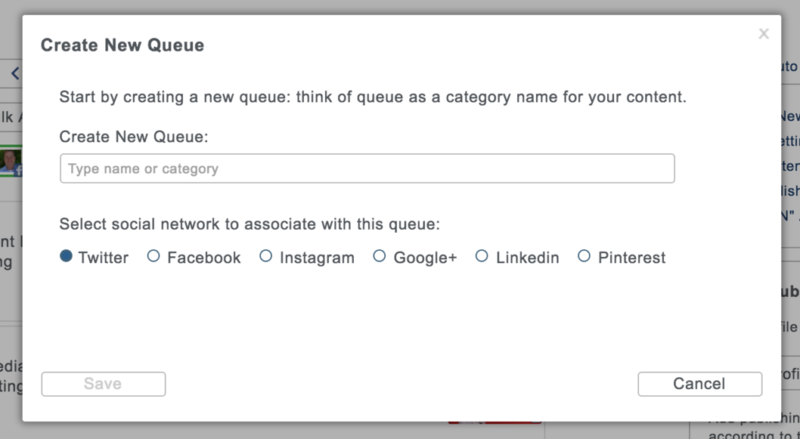 If you have a specific post you would like to publish with any of your queues, click on the New Post button to create new post. 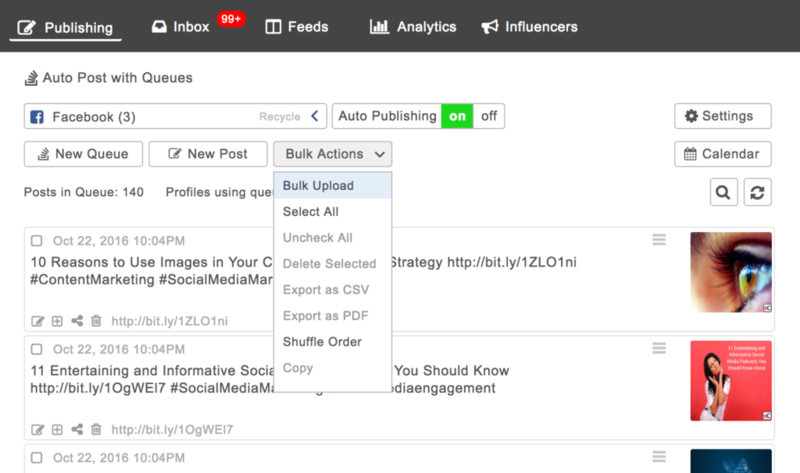 Using Bulk Actions, you can also Bulk upload up to 250 posts in one shot. 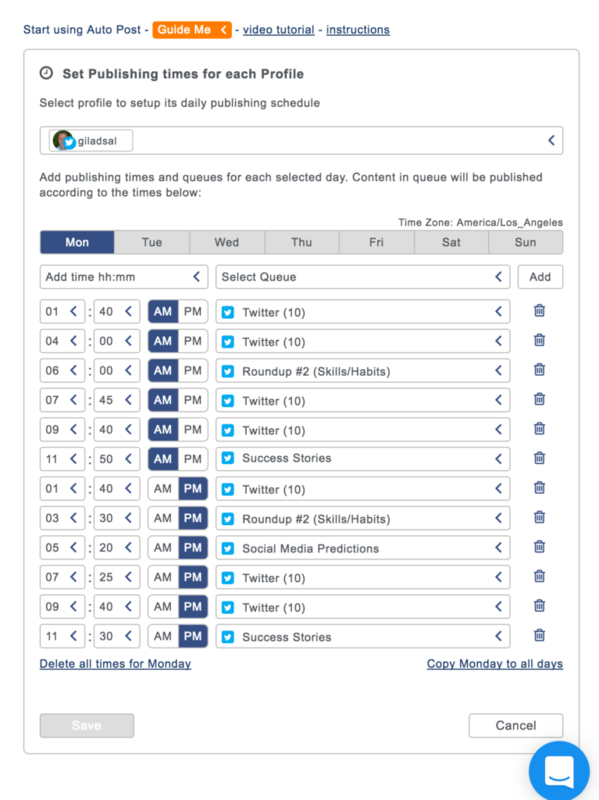 Next, add the publishing times by clicking on Set Publishing times for each Profile button on the right side of the screen. Select social media account, profile, page, or group. Start adding scheduled times for each day. You can select daily frequency and a queue name. Then click on Add button. Once you completed the daily schedule, you can easily duplicate that day to all the other days by clicking on copy to all other days . BTW, you can always click on the Guide Me button to see a quick reminder with 5 steps to set Auto Post, or watch the Auto Post video tutorial. eClincher Case Study – Let the Queues Do Their Magic / Promoting World Peace with the eClincher’s queue feature. Our friend, the Rabbi of the UN (@Cohen481) was busy saving the world, promoting world peace around the world, travelling abroad every few weeks and he didn’t have time to write new content for his blog and post it on his social media. Using the Cycle Queue is a perfect feature for our friend. He took famous world peace quotes, interspersed them with some posts about his upcoming book, and about a petition that he was running and he scheduled it to post every 15 minutes on twitter, for perpetuity. Take 100 posts -> put them on a recycle queue -> Increase Engagement and Grow your Audience while You are Sleeping! Are you struggling to find new content for your social media? Did you run of creative juice to write more blog posts? Don’t worry, eClincher has the right thing for you. 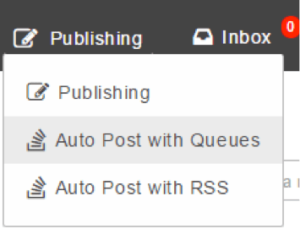 With our Auto Post with RSS feature you can take your own or literally any blog out there and add their articles and content into your queues. 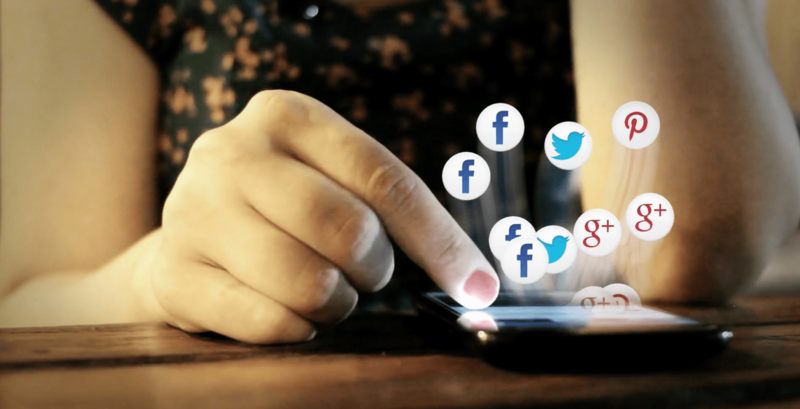 In 30 seconds you have brand spanking new content to share and engage your audience with. Go to Publishing, click on Auto Post with RSS and let’s get started! If this is your first time using this feature you will see an empty list of rss feeds. 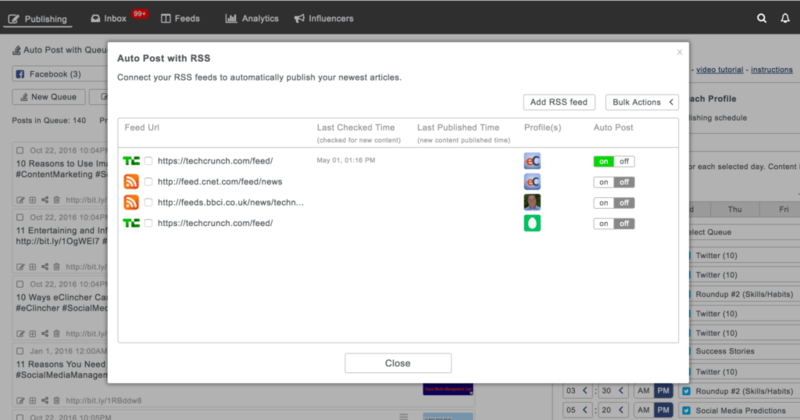 To add your first feed click on the Add RSS feed button. If you have a specific blog url in mind you can post the exact link to it in the box titled Enter feed URL. If there are more than one blog for that website, click on the magnifying glass to pick one. Choose which of your social media profils you would like to post this feed on. Then, check how often the feed should scan the blog for new posts (new content). 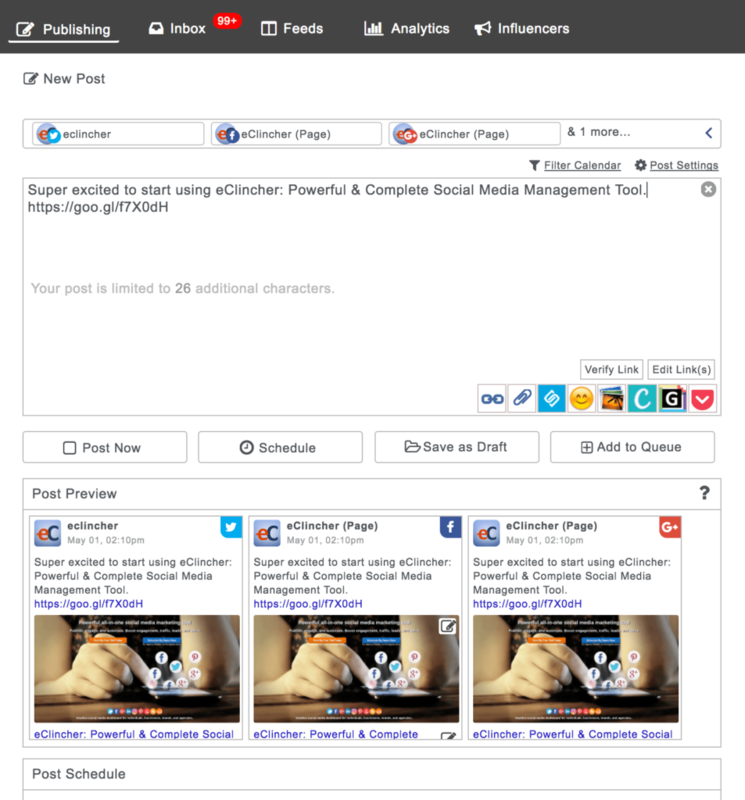 You can choose how many new fresh posts will be published to your social media profile. Then, add your text before (prepend) or after (Append) the post. 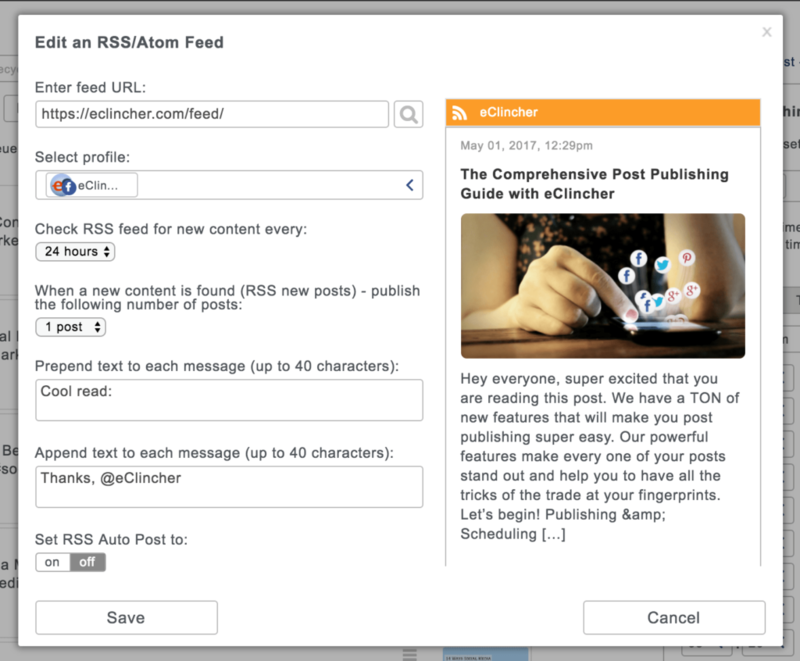 If it’s your own blog you might want to set the RSS feed to automatically post every article. If you want to look at every article before it posts leave that as is. We hope this tutorial helped you learn the ins and outs of writing, previewing, and scheduling your posts. Stay tuned for more powerful features that will make your social media posts even more viral and effective. a fantastic city builder in the marketplace.